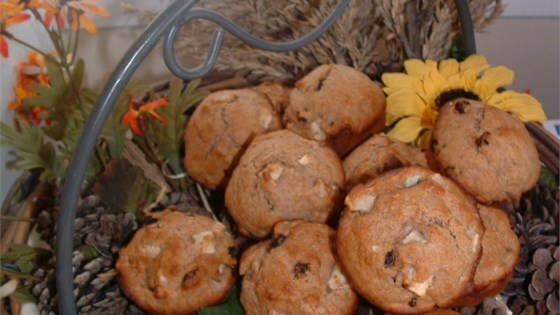 "A delicious low-fat muffin. Children love them. If desired, add a few raisins and/or some chopped nuts." not bad at all - I read some of the reviews before making it so I added a whole egg instead of 2 whites and a 1/2 cup of sugar istead of the 1/4 cup of honey - turned out great! This is a wonderful recipe! I like the fact that it has a low sugar content also; the honey gives it a kick! Absolutely delicious. I added raisins too. nice recipe- used 1 whole egg and used 1/2 cup of white sugar instead of honey and also added blueberries with apple just because I had them handy.